The number of women working in the mining sector has increased significantly over the past 17 years, with the numbers growing from 11 400 in 2002 to over 53 100 today. This represents about 12% of the entire mining workforce of 464 667. 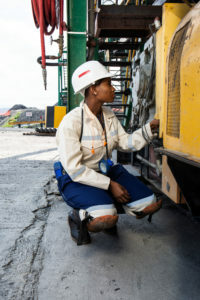 The mining industry has traditionally been a male-dominated space, particularly with regard to heavy work and – despite many strides having been made in terms of gender inclusivity – the environment still remains a tough one for women. It must be remembered that even performing basic bodily functions still holds significantly more challenges for women miners than their male counterparts. For instance, consider that the simple task of going to the toilet can be a hardship. Often, women who work underground must walk to toilets that are up to 400 metres away from a blast site (legal requirement) just to relieve themselves. To combat this, women have tendered to wear nylon tights underneath their pants for modesty purposes. Nylon does not absorb moisture, keeping the skin damp during the day which becomes a breeding ground for bacterial and fungal infections. Furthermore, because sweat in not absorbed, the salt crystals remain on the skin, rubbing together causing chauffing. In hot, moist environments, many women contract bacterial and vaginal infections due to such undergarments.